There are going to be a lot of giveaways during the next two weeks. A. LOT. So to make my life easier when it comes time to send out prizes, I request that everyone please fill out this quick, 2-question giveaway registration form. This form is not itself a giveaway - it will help me get prizes out faster and more efficiently. Each giveaway will have it's own means of entering and their own rules, but in order to enter any of them, you gotta fill out this form first. You only have to register via this form once. 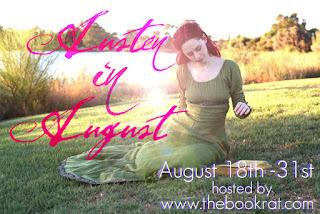 You are then free to enter any of the Austen in August giveaways through their various rafflecopters, as they go up. great idea - thanks for hosting and creatively promoting JA !! !